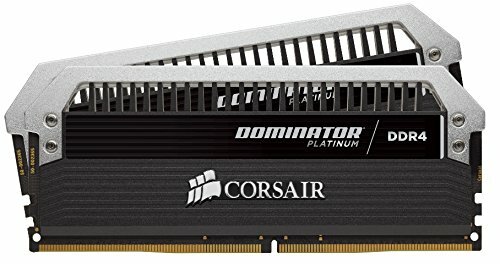 Dominator Platinum high-performance DDR4 memory is designed for world-class system builds. It's built with hand-screened ICs, undergoes rigorous performance testing, and incorporates patented DHX cooling for reliable performance in demanding. Dominator Platinum modules work with the Corsair Link system for temperature monitoring, and you can even enhance the subtle white LED lighting by adding a light bar kit (available separately) to match or contrast it with your system. Environments. he DDR4 form factor is optimized for the latest Intel 100 Series motherboards, and modules are compatibility-tested across multiple 100 Series motherboards for reliably fast performance. Extracting maximum performance is easy -- built-in XMP 2.0 support gives. The DDR4 form factor is optimized for the latest Intel 100 Series motherboards, and modules are compatibility-tested across multiple 100 Series motherboards for reliably fast performance. Extracting maximum performance is easy -- built-in XMP 2.0 support gives you trouble-free, automatic overclocking. Dominator Platinum DDR4 is optimized and compatibility tested for the latest Intel 100 Series motherboards and offers higher frequencies, greater bandwidth, and lower power consumption.